An entertaining, informative, and eminently useful guide that draws on psychology, data, and real-world experience to explain what really drives successful fundraising. In The Forgotten Foundations of Fundraising, Jeremy Beer and Jeffrey Cain, cofounders of American Philanthropic, a leading consulting firm for nonprofit organizations, offer practical lessons and unconventional wisdom for both nonprofit leaders and novices in the art and science of raising money. Drawing upon a wealth of experience, deploying an army of anecdotes, and using eye-opening American Philanthropic survey data, the authors provide a brisk, irreverent, and supremely useful introduction to fundraising for charities and nonprofits. 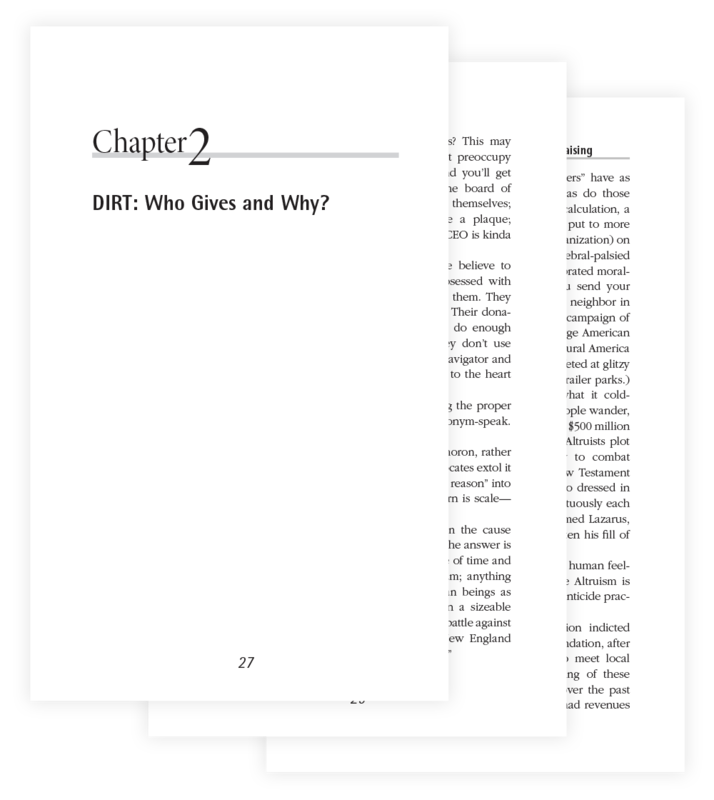 The book explains the hows and whys of a variety of fundraising techniques, from direct mail to planned giving programs. It explores the benefits and pitfalls of prospect research, the keys to donor retention, and the essential elements of a healthy nonprofit culture. It gives insightful advice on making personal meetings count, soliciting foundations, and training young fundraisers. And it does so with sprightly prose and sharp observations. You’ll never read another fundraising book quite like this one. Expertly deflating the pretensions of those who would make fundraising a bureaucratic and esoteric profession, Beer and Cain elucidate the practical knowledge and relationship skills that still matter more than anything else. They make an impassioned plea for the importance of civil society to American democracy and build a compelling case for fundraising as an honorable component of a healthy civic culture. Philanthropy is not about bottom lines and return on investment—successful fundraisers provide a platform for donors to affirm their ideals, values, and morals. Fundraising is serious, but learning about it needn’t be a chore. The Forgotten Foundations of Fundraising is at once eminently practical and absolutely delightful. Ready to read the second chapter? Click download, enter your email address, and the second chapter is yours for free. Jeremy Beer has worked in the nonprofit sector since 2000. Prior to co-founding American Philanthropic, LLC, in 2009, he was vice president of publishing and information systems at the Intercollegiate Studies Institute, where he also served as the editor in chief of the institute's award-winning press, ISI Books. As a partner at American Philanthropic, Jeremy has worked closely with dozens of philanthropies and nonprofit clients in such areas as strategic planning, message creation, program analyses and audits, major-donor club creation and implementation, direct mail, grant writing, and collateral material development. He is also the co-founder of AmP Publishers Group and has served as a literary agent for a select group of clients, including the Aleksandr Solzhenitsyn family. Jeff Cain is the Chief Executive Officer of CrossFit, Inc., and a founding partner at American Philanthropic, LLC. He served in the U.S. Marine Corps and holds a Ph.D. in English Renaissance Literature. He previously worked as President of the Arthur N. Rupe Foundation, Secretary of the Lillian S. Wells Foundation, and Executive Vice President of the Intercollegiate Studies Institute. Jeff is the author of Protecting Donor Intent: How to Define and Safeguard Your Philanthropic Principles (Philanthropy Roundtable, 2012), and has written for or been cited by the New York Times, Wall Street Journal, the Chronicle of Philanthropy, Philanthropy magazine, the Washington Legal Foundation, and Front Porch Republic. Jeff has spoken on philanthropy-related topics at the Philanthropy Roundtable, the Bradley Center for Philanthropic Renewal at the Hudson Institute, and the State Policy Network, among other venues. The not-so-secret key to nonprofit success is doing the right things well, consistently, and over time. The company that Jeremy leads, American Philanthropic, provides strategic consulting and services, practical training, and essential tools to help nonprofits build high-performing operations. Buy the Forgotten Foundations of Fundraising Today!